The third time was a charm for the Toronto International Film Festival’s Platform programme. The competitive sidebar at North America’s biggest film festival was the must-see slate of #TIFF17 despite the showier ranger of titles and Oscar contenders in the Gala and Special Presentations programme. 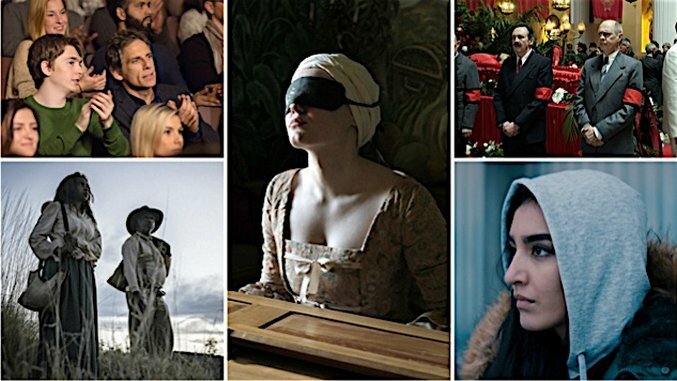 Despite an embarrassing absence of Canadian filmmakers in Toronto’s effort to promote the next generation of auteurs, this year’s Platform competition showed the festival has a hand on the pulse of the industry. Platform highlighted a dozen films in a line-up that featured gender parity, a diverse range of styles and voices, and emerging talents from visual art, television, film. Juried by the prestigious trio of Chen Kaigel (Farewell, My Concubine), Ma?gorzata Szumowska (Elles) and Wim Wenders (Pina), choosing a favorite from the Platform competition was no easy task. The programme opened on a high note with the world premiere of The Death of Stalin from In the Loop director and Veep creator Armando Iannucci. This roaringly funny ensemble film satirizes the death of the notorious Soviet dictator with an A-list peanut gallery of stars including Jeffrey Tambour, Michael Palin, Jason Isaacs, Andrea Riseborough and Steve Buscemi in an award-caliber performance as Nikita Khrushchev, who slyly took control of the Soviet Union like a wise guy looking to steal Tony Soprano’s throne. The Death of Stalin features the manic energy of Iannucci’s other ensemble comedies as anxiety and tension fuels a minefield of conspiracies and zingers. The film was also one of the timelier and more provocative titles at TIFF since one couldn’t help but draw parallels between the darkly funny folly of Iannucci’s Soviet Russia and the regrettable political circus of Donald Trump’s America. In a festival rife with films that engaged with the implications of the Trump environment, The Death of Stalin had its finger on the hottest button. The programme’s other comedy, Mike White’s Brad Status, zeroed in on contemporary identity politics on an intimate level in this neurotic character study that boasted a career-best performance from Ben Stiller. Brad’s Status solidifies White as one of contemporary cinema’s great screenwriters after delivering the equally engaged (and somewhat better) Beatriz at Dinner earlier this year. “There are moments when you feel like the values of your country are more vulnerable than ever,” White said in an interview with Paste at the festival. “As an artist, it feels more important to assert your value system and talk about things that feel relevant to now … obviously Beatriz at Dinner touched on those things. I feel an onus to write about and engage with these issues and ideas.” Brad’s Status captures the zeitgeist with its ability to put audiences into the anxious mind of a comfortably middle class straight white male. While The Death of Stalin and Brad’s Status gave comedic takes on corrupt politics and alienation, Nabil Ayouch’s Razzia brought stories of the Arab Spring to the competition, and with them a thoughtful call for peace. This intricately and dexterously crafted drama offers a kaleidoscope of perspectives from Casablanca as five Moroccans make sense of the wave of conservatism clouding their land. Co-written by Maryam Touzani who offers a standout performance in the film as Salima, a woman who turns heads for her beauty and her rebellious conviction to fight the patriarchy through hiked up skirts and make-up, Razzia dissolves one story into another as narratives of prejudice, broken dreams, and lost love haunted the city. Images from Michael Curtiz’s Casablanca permeate the film as a shy bartender immerses himself in the escapist dream of Rick and Ilsa’s romance while failing to recognize that every scene of the film was shot in Hollywood. Echoes of “As Time Goes By” waft through the film with cues from Queen’s “I Want to Break Free” as Ayouch conveys impressions of a culture struggling to find its identity in an increasingly fragmented world. Morocco has submitted the film to the Oscars in the Best Foreign Language Film Race following its Platform debut, and it’s one to watch since Razzia is a powerful and engaged work of art. Fragments of narrative and memory didn’t come together quite as seamlessly in Joan Chemla’s melodramatic potboiler If You Saw His Heart. The film, arguably the one all-out misfire of the competition, blended genres and tones in an elusive and indecipherable fever dream starring Gael García Bernal as Daniel, a petty crook haunted by the death of his friend. Chemla, a graduate of TIFF’s Talent Lab, offered a fair opportunity for the festival to showcase its own talent in its spotlight programme, but If You Saw His Heart simply left too many loose threads and inconsistencies in style and tone. Chemla nevertheless showed ample ambition and potential as an up-and-comer. The filmmakers both call upon the evocative power of the natural landscapes with Barnard’s painterly eye for composition excelling with damp fecund fields and murky shadows, while Pearce’s storybook palette subverts conventional tales of romance. Both films also draw upon exceptional performances from lead actresses: Wilson’s killer performance in Dark River marks her meatiest role yet, while Buckley gives a breakout turn as a young woman wrestling with the beast within. These stories of trauma and memory were unsettling tales that lingered long after the credits rolled. Equally evocative was Indonesian director Kamila Andini’s breathtakingly mystical The Seen and Unseen, which introduced audiences to a worthy successor to Thai arthouse master Apichatpong Weerasethakul in this dreamy tale of life and death. The film looks at the bond of ten-year-old twin siblings, brother Tantra and sister Tantri. When Tantra becomes hospitalized with terminal brain cancer, Tantra struggles to grasp the impending loss of her kindred soul, and Andini eloquently used the idea of twinning to explore boundless worlds of dualism as these two souls who once shared the womb faced new lives in the worlds of life and death. Andini displays a fearless hand for bringing the best out of child actors—unsettling scenes see Tantri pray to the moon in dreamlike sequences of dance and surreal child’s play, as her her charms awaken the ghosts of dead children who roll through the fields restless with the youthful spirit of souls taken too soon. This near-silent picture evokes a hypnotic meditation on life and death thanks to Andini’s unique eye for magical realism. This auteur-in-the-making is one to watch on the world cinema scene. Joining Andini at Platform in terms of ushering in a new generation of women behind the camera was Lisa Langseth with her buoyant and revitalizing Euphoria. The film, like its Indonesian co-competitor, featured a tale of life and death. Sisters Ines (Alicia Vikander, also serving as producer for the first time) and Emilie (Eva Green) arrive at an exquisite Swiss spa and embark on a deep re-evaluation of life’s goals and purposes. Anchored by the bond between two siblings, the film becomes richly emotional as Emilie reveals that she has terminal cancer and aims to spend her final days reconciling the past with her sister before ending life on her own terms. This film is profoundly moving as Langseth delicately balances a story about death that emphasizes life. Langseth doesn’t aim for realism in her well-researched study of assisted suicide—and the setting of the spa at an exquisite Swiss resort that resembles the luxury hotel from Paolo Sorrentino’s Youth shows a prioritizing of aesthetics over accuracy. Vikander and Green are excellent together and have a natural bond that helps Langseth’s subtle direction bring the film to a deeply cathartic climax. Euphoria was a moving and life-affirming experience. Barbara Albert and Iram Haq joined Langseth in making a strong stand for films by and about women with Mademoiselle Paradis and What Will People Say. The films offered a fine companion set of films by which the competition interrogated the subjection of women both past and present. Both dramas are driven by captivating female leads and unabashedly feminist perspectives. Albert’s Paradis, set in 1770s Vienna, featured a committed performance by Maria Dragus as Maria Theresia von Paradis, an aspiring harpsichordist who turned heads in the era of Mozart and Haydn. Albert bookends the film with long takes of Dragus mastering the ivories in her tour de force turn as the blind artist who controls the keys with heightened senses. The film is somewhat stiff and clinical in its dramatization of the unorthodox treatment Paradis endured to restore her vision, but Albert’s exquisitely tailored and researched film brought visionary work to the competition. While Albert drew upon the life of a historical figure, Ham’s story dramatized a personal experience. What Will People Say is a harrowing family drama in which a young woman named Nasha (Maria Mozhdah) finds herself displaced in two worlds when her rigidly patriarchal migrant father (Adil Hussain) abducts her from the family home and smuggles her out of Norway to his native Pakistan as punishment for kissing a boy. The film finds a heartbreaking and urgent story in Nasha’s fight for agency that sees her humiliated, alienated and subjected to horrible violence. What Will People Say veers into everything-but-the-kitchen-sink territory in its final act, but Mozhdah’s compelling performance honors the daughters around the world who fight for respect and agency. There were, however, two standout films at the competition. Custody marked an exceptionally strong feature debut for Xavier Legrand. The filmmaker returned to his Oscar-nominated short drama Just Before Losing Everything to continue the story of a family torn apart by violence. The feature picks up just a few years after the short left off and saw the parents Antoine (Denis Ménochet) and Miriam (Léa Drucker) in a bitter custody battle that made the father refute the violent portrayal audiences witnessed in the short. When Legrand moves from the lengthy legal hearing to the first instances of joint custody that Antoine hopes would heal his family, the film thrusts the audience into survival mode with the family’s absorbing fight as violence escalates and emotions run high. Legrand unspools the drama in close proximity to real time as Antoine’s increasingly aggressive behavior leads to a heart-pounding climax. Fueled by exceptional performances—of particular note is young Thomas Gloria in an astonishing debut performance as the 11-year-old Julien, who steals nearly every scene of the film—Custody is a bracing, at times terrifying, adrenaline rush that never lets up. Legrand’s direction is exact and precise, leaving one barely a moment to breathe in this taut family drama. Warwick Thornton’s Sweet Country took home this year’s $25,000 prize. Director Warwick Thornton (Samson & Delilah), finally, delivered not only the best film of Platform but the best film of the festival overall with Sweet Country. Sweet Country’s sound designer and screenwriter David Tranter draws upon a 1929 story of one of his ancestors to dramatize a bloody tale in which Indigenous farmhand Sam Kelly (Hamilton Morris) goes on the lam after fatally shooting a racist white war veteran (Ewen Leslie) in self-defense. This visionary film revamps the western by exploding themes of race and empire in an intense manhunt fueled cultural prejudice as crusty war vet Sergeant Fletcher (a deliciously evil Bryan Brown) leads a crew through the Australian outback and desert in search of Sam and his wife, Lizzie (Natassia Gorey-Furber). Thornton, who also shot the film, has stripped the film of western clichés and harnessed the power of the landscape in expansive shots and a soundtrack that favors natural elements over instructive music. Sweet Country evokes the larger and ongoing struggle of a land and its people as Thornton has rewritten the western to envision an endless cycle of violence wrought by colonial forces. At a year in which the festival strove to encourage diversity of voice and catapult a new generation of auteurs from traditionally underrepresent communities, TIFF found an authentic voice worth championing with Sweet Country and its badass song.